Dwarf Lemon Ice originated from a cross between Anna Banana Russian and Roza Vetrov made by Patrina Nuske Small in 2007 named Nosey F1. 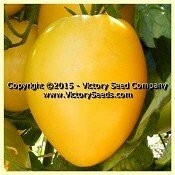 Dwarf Lemon Ice is a mid-season regular leaf dwarf producing abundant small to medium 4-6 oz lemon-yellow heart shaped tomatoes with paler yellow dense flesh. One project volunteer declared it to be the best tasting variety of their season. Plants grow to around 3 ft and have a wispy-leaf version of dwarf foliage so they are less dense with finer leaves than other varieties. Dwarf Lemon Ice was selected and named by project volunteer Linda Black.